Thousands of hours of research and testing have lead to the development of Lake Country ThinPro Foam Pads! This all-new line of foam pads, exclusive to Autogeek, is manufactured from state-of-the-art foam compositions that you won’t find anywhere else. ThinPro Foam Pads - as the name suggests - are ultra thin, lightweight foam pads designed to eliminate pad-stalling on random orbital dual action polishers. Each pad has a dense composition to provide more control and superior cutting or polishing action. There’s a lot more to the ThinPro Foam Pads than just a low-profile design. 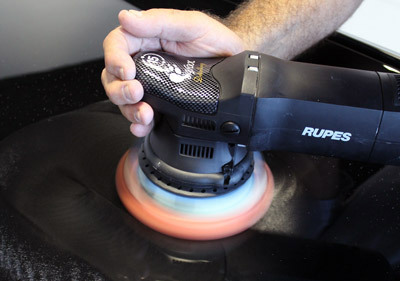 Each pad utilizes a new foam composition that promises to withstand the rigorous abuse of long-throw orbital polishers, like the Rupes LHR 15 and 21ES and Griot’s Garage Boss G15 and G21 polishers. A super strong adhesive used for attaching the backing material to the foam pad provides a rugged attachment point that is virtually indestructible, even after extended polishing sessions. Lake Country ThinPro Foam Pads are constructed using super dense hybrid foam. What’s the advantage of hybrid foam? For one, it cuts more and finishes better than the standard foam used in other pads. Second, it helps keep more product on the face of the pad, eliminating waste while reducing heat build up. Last but not least, it outlasts conventional foam pads. Due to high density foam, these pads are long-wearing and maintain their shape through many uses. 5.5 inch ThinPro Gray Extreme Cutting Pad –This pad has an open cell that can dissipate heat well and stays pretty firm even with heat from the polishing process. Use it for spot repair or heavy compounding. 5.5 inch ThinPro Orange Heavy Cutting Pad – This foam pad provides the level of cut expected from a foam cutting pad, but finishes like a foam polishing pad! It removes most paint imperfections and leaves a finish that is nearly wax ready. 5.5 inchThinPro White Polishing Pad – The white pad features very dense foam. Use this pad to remove light imperfections, apply a light polish, cleaner wax, and any jobs for which you'd use the standard Lake Country white polishing pad. 5.5 inch ThinPro Black Finishing Pad – This pad provides no mechanical cutting ability but thanks to its dense foam, it provides superior control while polishing. It features super soft foam, which makes it ideal for finishing polishes, waxes, sealants, and glazes. 5.5 Inch ThinPro Red Finishing Pad – This soft, imported foam is ideal for applying the final coat of wax or sealant. The foam works especially well when applying liquid waxes or sealants because it is firm enough to keep the majority of the product on the paint, rather than soaking it up. Wash Lake Country ThinPro Foam Pad with McKee's 37 Polishing Pad Rejuvenator and lay flat to dry with the backing material facing up. Store dry pads in sealed bags or bins to prevent contamination between uses. Use with a 5 inch hook and loop backing plate.